New Delhi: An Indian Oil Corp. Ltd (IOC) pipeline project, which is expected to reduce oil transportation cost to Nepal by as much as 60%, has gained momentum with the visit of Pushpa Kamal Dahal, the Himalayan nation’s prime minister, to India last week. IOC, India’s top refiner, has decided to give a push to the project as a confidence-building measure. “IOC will invest in setting up the pipeline. The plans are at a preliminary stage," said S.V. Narasimhan, its director of finance. He did not say how much it could cost. IOC is the sole supplier to Nepal Oil Corp. Ltd (NOC), the state-owned marketer of petroleum products in that country. The project proposes to link an IOC facility at Raxaul in Bihar with NOC’s main terminal 29km away at Amalekhganj across the border. A Nepal government official, asking not to be named, said the prime minister had pushed for expediting the pipeline project during his four-day tour to India that ended on 18 September. “We want the pipeline. We are importing fuel by trucks and it is very costly. This just doubles the prices in Nepal. However, we do not have the money to invest in the pipeline," said Ganesh Prasad Dhakal, director general in the commerce department under Nepal’s ministry of industry, commerce and supplies. Nepal, which has an annual demand of 580,518 million tonnes of petroleum products, is facing a severe shortage, with supplies enough to meet only half the demand. IOC, which revises the prices of products it sells to NOC on a fortnightly basis, has curtailed supplies due to poor payment. The current dues from NOC are Rs85 crore. They had touched a high of Rs500 crore in 2005-06. “While our purchase rate is higher, our selling price is low. This difference has led to our inability to pay IOC on time. Until the prices are matched with international prices, nothing can be done," NOC’s Dahal said. NOC sells petroleum products at subsidized prices and loses 200 crore Nepalese rupees (Rs125 crore) a month. 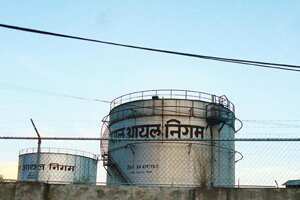 In order to purchase petroleum products from IOC, NOC has taken loans from commercial banks and other financial institutions in Nepal and currently has a total debt of Rs1,000 crore. “We are doing our best to service these loans. However, when we pay IOC, we can’t service these loans and vice-versa," said Dahal. The Indian government has meanwhile promised 300 crore Nepalese rupees to help the country maintain a petroleum products reserve of 15 days. It currently has less than three days of reserve.